Welcome back to another Reading List post! This month was a little weird on the reading front. Mostly because I started reading a few books in my massive TBR pile (my ebook reader has over 1,200 books on it, mostly unread, and there are several unread books on my book shelves and in boxes that I declined to count because I’m lazy, or maybe just because I don’t care to, anywhoo…) and within the first 50 pages or less I lost interest and abandoned them. Now, don’t get me wrong, they weren’t all bad stories, although there were a few that bordered on being not something I would enjoy reading. But I think for the most part, it had more to do with me not being in the mood for certain genres or story lines. Please Note: As of this month, I will no longer be posting a picture from or linking to the books Amazon page. This is a personal preference. All pictures of books come from their respective author or publisher websites. Description: The military sci-fi classic of courage on a dangerous alien planet. The planet is called Banshee. The air is unbreathable, the water is poisonous. It is home to the most implacable enemies that humanity, in all its interstellar expansion, has ever encountered. Body armor has been devised for the commando forces that are to be dropped on Banshee—the culmination of ten thousand years of the armorers’ craft. A trooper in this armor is a one-man, atomic powered battle fortress. But he will have to fight a nearly endless horde of berserk, hard-shelled monsters—the fighting arm of a species which uses biological technology to design perfect, mindless war minions. This is Felix’s story—a story of the horror, the courage, and the aftermath of combat, and the story, too, of how strength of spirit can be the greatest armor of all. My Thoughts on the Book: I first read this book 20 years ago (Damn! That makes me feel old!) and while I couldn’t remember most of the book, there were parts of the story that stuck with me throughout the years. So when I saw it at the library book exchange several years ago, I grabbed it for a refresher course. Basically, I wanted to know if the story was as good as my teenage mind thought it was. Since I decided to take a sick day from work last week, I decided it was a good day to read Armor. Now, I’m really torn on whether I liked this book or just find the authors treatment of the tale to be fascinating. Probably a little of both. Without giving too much away, I found the way John Steakly wrote the book from the POV of Felix and John Crow to be very nicely done. And while there was a great reasons for the two characters point of views being there, there wasn’t any head hopping from one chapter to another. The book was broken into four parts. Parts one and three told Felix’s story (which happens in the past), while parts two and four told John Crow’s story. For those into Military Science Fiction who don’t mind reading an “old book” (first published in 1984), I would recommend it. Description: A writer’s attitude can help bring success. But what should that attitude look like? Rah-rah positive? Pragmatic? Take-no-prisoners serious? 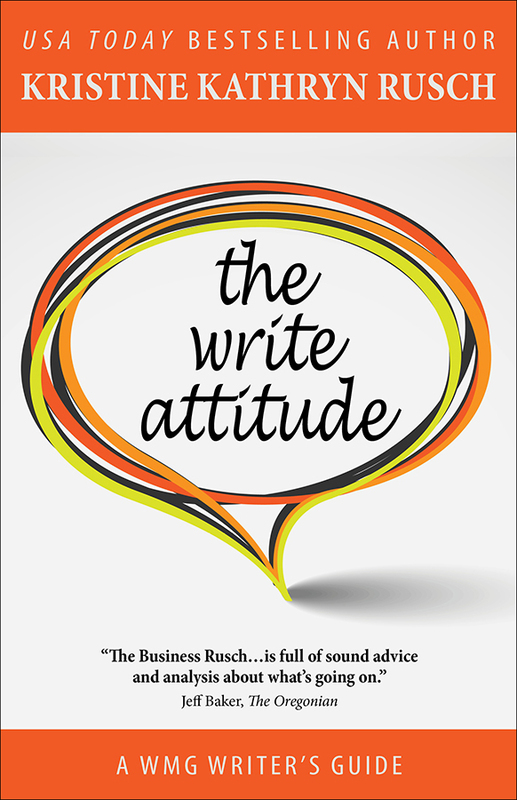 USA Today bestselling author and renowned business blogger Kristine Kathryn Rusch helps guide writers to find the right attitude for a long-term writing career in this latest WMG Writers’ Guide. Rusch covers topics such as habits, the importance of routines, the dangers of following a crowd, and how to create—and follow—one’s own vision of a writing career. With The Write Attitude, Rusch shows writers how they can do what they love and love what they do without sabotaging their own success. My Thoughts on the Book: This is a very short, non-fiction book for writers but it is packed with great information from a professional author who has been writing books for 30+ years. Some of my favorite chapters included: 1. Habits, 2. The Importance of Routines, 5. Following the Crowd, 6. Indispensable, 8. One Phone Call from Our Knees, 10. Believe in Yourself, and 12. The Writer You Want to Be. I got a ton of great information from this book about creating a long-term writing career and I’m looking forward to applying some of what I learned to my life. I highly recommend this book to any writer who wishes to have a successful, long term career as a writer. Click on the image to be taken to my newsletter sign up form and subscribe!